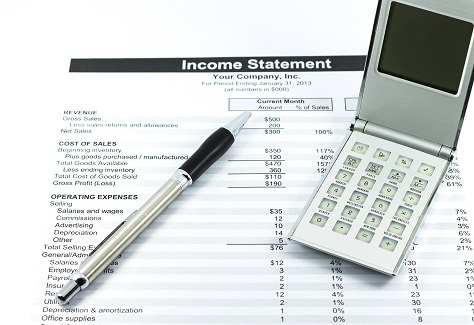 In this Accounting 101 The Income Statement article, I want to discuss the importance for every business owner to understand how to read and interpret their income statement. This financial report is also know as the profit and loss statement, which is what you may know it better as. To prepare for the meeting I asked her to send me her financial statements. Imagine my surprise when she said she doesn’t have a bookkeeper and therefore has no small business accounting 101 financial statements. As mentioned above, we are focusing on the income statement in this blog. Every business owner should be using their income statement to track revenues and expenses so that they can determine the operating performance of their business over a period of time. SMBs (small to medium-sized businesses) should use their accounting 101 balance sheet and income statement to find out what areas of their business are over budget or under budget. Specific items that are causing unexpected expenditures can be pinpointed, such as phone, mail, print, or supply expenses. Income statements can also track dramatic increases in product returns or cost of goods sold as a percentage of sales. They also can be used to determine income tax liability. As we know from Accounting 101 Chart Of Accounts, the income statement is one of the most important financial statements for a business owner to keep an eye on. From an overall accounting perspective, knowing how to read and interpret your income statement help business owners to better formulate an intelligent, differentiating net income comparison between specific periods of operation records. This very important business financial statement compares the current year's income and expenses to those of the previous year. When this financial statement is read properly, the recorded data helps you to decipher whether or not your business is making money the way it should be. The income statement gives you, as the business owner or bookkeeper/accountant, an idea as to what is making your business money and what is losing money. In Accounting 101 the income statement measures a certain period of time in which a business operates including monthly, quarterly or annually. Of course, your business never stops operating, but the income statement is a good comparison tool for figuring net income increase or decrease per statement period. What is ideal for these comparisons is a steady net income growth realization. If you find there are more credits to debits, the business's net income increases. In other words, your business is doing well. However, if there are more debits to credits, the business experienced a net loss, causing over all business assets to decreases. When this happens, your business is not doing so well. When reading your business's profit and loss income statement, keep in mind that the document will be broken down into several detailed parts. This may sound intimidating but breaking the income statement into manageable chunks of information makes it easier for you to read and interpret the statement. Revenues from the continuing operations section is the most important part of any business's income statement. Results from this section can predict your company's future earnings when compared to past continuing operations net income or net losses. The items included in your business's continuing operations involve revenues from sales of your company's products or services, costs of the products or services, operating expenses such as utilities, rent and HVAC, income tax expenses and gains or losses of revenue during business operations. In Small Business Accounting 101 the income statement is a fundamental statement that all business owners should grasp and know how to use to track their businesses revenues as well as deductible expenses. That will equip them with the necessary information to determine the operating performance of their business over a period of time.